In my previous Cartoon Research post, I promised some exciting news about upcoming projects–and I’m proud to finally share the first bit! Much of this year has been spent handling the release of my first Blu-ray/DVD collection, Cartoon Roots. That means assembling the cases, booklets; from packing and shipping out each copy to answering questions for reviews and articles about the set. It’s all been a true pleasure and valuable learning experience. Needless to say, I’ve wanted to move on to a second release, and many people out there have already asked me when I would be doing this. Now’s the time. 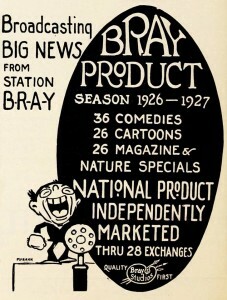 To backtrack a bit, my main pet project for the last few years has been researching and archiving the early animated cartoons produced by Bray Studios, which was the first successful animation studio ever founded. 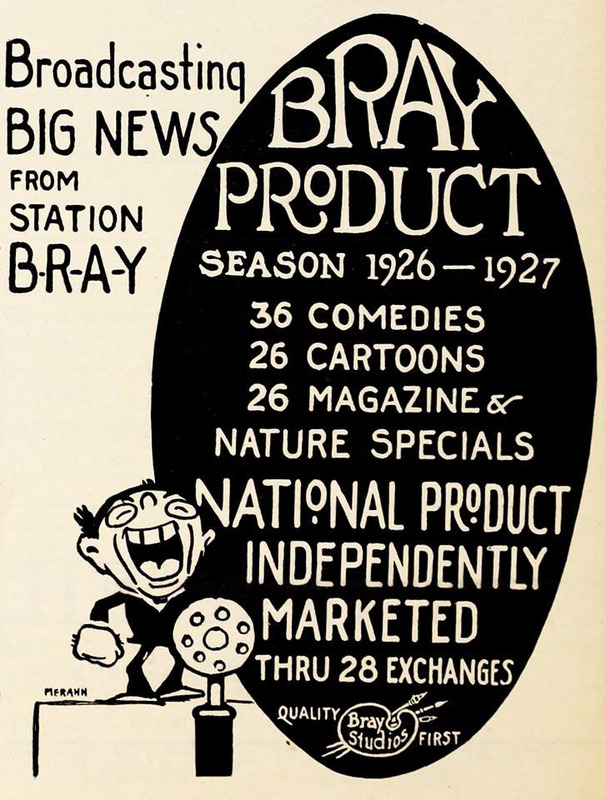 Bray Studios launched the animation industry as well as the careers of many future animation legends: Max Fleischer, Paul Terry, and Walter Lantz, to name the most famous examples. 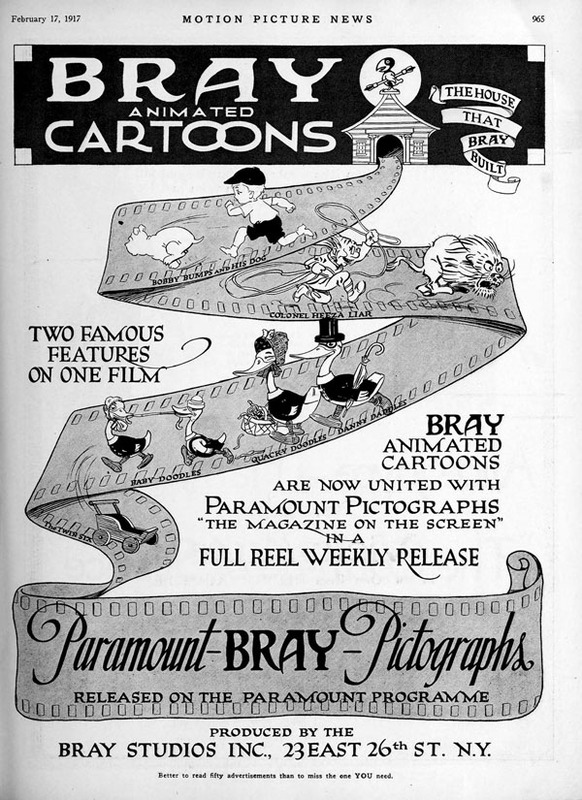 The studio produced more than five hundred animated films (including both comical and educational subjects) between 1913 and 1927, many of which are currently lost, and most of the surviving examples have simply been unavailable or given brief attention over the decades. 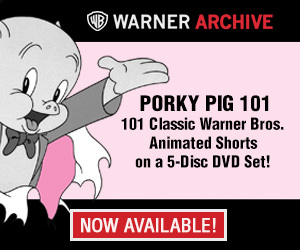 To pay homage to this important studio, and as a sensible second entry in my Cartoon Roots series of early animation releases, I feel an introductory Bray Studios Blu-ray/DVD collection is the best next step to take. I need your help to make it a reality, though (generally speaking, film archivists don’t make a lot of money–especially us independent ones! )…and that’s why the project has gone the crowd funding route. If you’d like to hear more about what this project and release entails, and how you can help bring it to life, please head on over to its Kickstarter page. In case you’re wondering: a certain Steve Stanchfield will be helping on the production end! My long term plan is to have many releases like this available for the general public, and I thank readers in advance for their help in making Release #2 a reality. If the Kickstarter is unsuccessful, the project will still go on, but for financial reasons, it could be delayed by a year or more–so let’s band together and act fast! Fundraising ends on September 9th, 2015. I appreciate the help! Now THIS is something. I’ve got the first “Cartoon Roots”, and this would make a wonderful companion. Just watched the video, and I’m thrilled by the time you, and other fine folks took to restore and compose music for these rarely-seen American gems. I saw your program on Turner Classic Movies, and was thrilled. (Say– the print you showed there of “Farmer Al Falfa Sees New York” reminds me of that “enhancement” of Bonzo the Dog in “Tanked” you have on YT. Did David G. work on that particular one?) I would be very proud to support this project of yours, and hope you discover more and more rare silent animation! (Hopin’ you lay yer hands on one of dem “Quacky Doodles”!) Would love to be let known of progress on the possible 2nd “Cartoon Roots”. I’ve faith in youse! Hi Evan, thanks! Yes, David G. was responsible for the soundtrack on that Farmer Alfalfa. Lots of fun! Wow, good luck on the Bray project, Tom! Although, now I feel bad for just ordering a copy of “Technicolor Dreams” on Amazon instead of “Cartoon Roots” (I didn’t run into Steve at Columbus’ Cinevent this year hence why I’m getting late on the new releases). Out of curiosity, will you have any sort of side printed material with the CD? I ask, because I have the original of a very rare book of Earl Hurd’s editorial cartoons he did for a Kansas City newspaper a few years before he joined the Bray studio. I believe that some of the APAToons crowd have copies of the monograph I wrote on it. Hi Eric, have never been an APATOONS member but the monograph is here with me on long term loan from David Gerstein. Love it, of course! 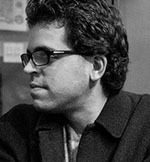 I would definitely like to discuss the Earl Hurd printed material more with you, so feel free to get in touch via email etc. Thanks! You’ll notice that the Baby Doodle’s wagon/carriage is called “The Twin Six”. This is what Packard Motor Cars called their twelve cylinder luxury car at the time.